Buckinghamshire or Bucks for short is a county in South East England which borders Greater London to the south east, Berkshire to the south, Oxford to the west, Northamptonshire to the North, Bedfordshire to the north east and Hertfordshire to the east. It is a home county and towns such as High Wycombe, Amersham and the Chafonts in the east and southeast of the county are parts of the London commuter belt, forming some of the most densely populated parts of the county. The largest town is Milton Keynes in the northeast and other large towns are Aylesbury, Marlow in the south near the River Thames and Princes Risborough in the west near Oxford. Areas around the old county town of Buckingham and near Olney in the northeast are less populated due to no direct rail links to London. A large part of the Chiltern Hills, an Area of Outstanding Natural Beauty runs through the south of the county attracting many walkers and cyclists especially from London. The Chilterns are an area of many wonderful villages and hamlets with beautiful older buildings mostly built from local flint and red brick. The two highest points in Buckinghamshire are Haddington Hill in Wendover Woods where a stone marks it summit at 267 metres (876 feet) and Coombe Hill near Wendover at 260 metres (850 feet).To the north of the county lies rolling countryside in the Vale of Aylesbury and around the River Great Ouse and the River Thames forms part of the county’s boundary to the southwest. The Great Ouse and the Thames that run through Buckinghamshire are two of the four longest rivers in England. The main branch of the Grand Union Canal also passes through the county as do its arms to Slough, Aylesbury, Wendover (disused) and Buckingham (disused). The canal has been incorporated into the landscaping of Milton Keynes. The Chiltern Hills form a chalk escarpment known locally as the Chilterns and a large portion of these hills was designated officially as an Area of Outstanding Natural Beauty in 1965. They cover an area of 322sq miles and are 11 miles at their widest and stretch 46 miles in the southwest to northeast diagonal from Goring on Thames to near Hitchin in Hertfordshire. The highest point at 876ft is mark by a stone monument at Haddington Hill near Wendover in Buckinghamshire. 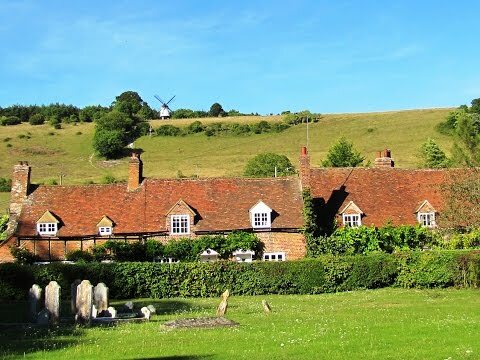 Turville in the Chiltern Hills is a small unspoilt very pretty village 5 miles north of Henley-on-Thames and 5 miles west of High Wycombe. The small village green is surrounded by a pub The Bull and Butcher, the 12th century St Mary’s Church which is built largely of local flint and attractive period cottages. The manor of Turville once belonged to the Abbey at St Albans and was seized by the Crown in the Dissolution of the Monasteries in 1547. It has since been rebuilt as Turville Park. Turville Hill, including Cobstone Windmill which is set high above the village, is a Site of Special Scientific Importance. Although there is a footpath from the village that leads up to the windmill it is a private dwelling and not open to the public. Turville is one of Britain’s most frequently used film and television locations due to its picturesque cottages and its location at the bottom of the Hambleden Valley. St Mary’s Church, the pub and the cottages have featured in several episodes of Midsomer Murders. The church was used in the TV series The Vicar of Dibley. In the village Goodnight Mister Tom and the 1942 wartime propaganda movie “Went the Day Well” were filmed. The windmill on the top of Cobstone Hill overlooking Turville appeared in Dark Autumn and was Caractacus Potts home in the film Chitty Chitty Bang Bang. Turville was home to Ellen Sadler who fell asleep in 1871 at the age of eleven and did not wake for nine years. She became known as the “Sleeping Girl of Turville” and attracted international attention from newspapers, medical professionals and the public. Hambleden is a small pretty village in South Buckinghamshire close to Mill End near Henley on Thames which is in Oxfordshire. The cottages in the centre of the village are made of brick and flint, the Norman Church of St. Mary the Virgin dating back to the 14th century was built of flint and chalk and the Elizabethan manor house opposite the church was built in 1603 of flint and stone. Charles I stayed overnight in the manor house in 1646 while fleeing from Oxford, Lord Cardigan who led the Charge of the Light Brigade was born in the house which is now the home of Maria Carmela, Viscountess Hambleden and the village was also a base for USA soldiers during the build up to D-Day in 1944. The village houses a post office with a shop and tearoom and also a pub the Stag & Huntsman with B&B accommodation. Hambleden has often been used as a location for films such as Chitty Chitty Bang Bang, The Witches, Dance with a Stranger, some scenes in 101 Dalmatians, the opening scenes of the recent remake of The Avengers and also Sleepy Hollow starring Johnny Depp and Christina Ricci which was a month long location shoot at Lime Tree Valley in Hambleden. The Stag & Huntsman Inn was originally known as the Dog and Badger and it is said that it changed its name in 1820 and the pub at nearby Medmenham took the original name and sign. Skirmett is a hamlet between the villages of Hambleden and Fingest in the Hambleden Valley of the Chiltern Hills. On one side of the hamlet there is a row of brick and timber framed cottages and one pub called The Frog, which was once known as the Kings Arms. The old police house, Hope cottage, and the simple flint church dated from the mid 19th century have both been converted into private homes. Fingest less than a mile north of Skirmett is a small unspoilt hamlet housing a pub The Chequers Inn, the Church of St Bartholomew, a Manor and a number of Medieval and Georgian cottages. The 15th century Chequers Inn was a rustic rural ale house but now a quaint country pub it boasts to have the best public garden with the finest views of the Hambleden Valley. The early Norman church which has an unusual tower with a double vaulted roof is a Grade 1 listed building. Fingest is also known for filming the pub itself was used in Foyle’s War and featured in the film “Monuments Men” and episodes of Midsomer Murders have also been filmed here. The Manor, now privately owned, belonged to St Albans Abbey and was given to the bishop of Lincoln in 1163. It was then used as the country home for the Lincoln diocese until 1547 when it was seized by the Crown. Two years later it was given to the Duke of Somerset who exchanged it with a property belonging to Wells Cathedral. Shakespeare’s Way which opened in 2006 is a long distance footpath that runs for 146 miles between Shakespeare’s birthplace at Stratford-upon-Avon and Shakespeare’s Globe at London. From Stratford the path follows the valley of the little River Stour, crosses the Oxfordshire Cotswolds then goes through Blenheim Park and Woodstock before passing through the city of Oxford. It now heads over quiet country through which the River Thames flows before crossing the wooded Chiltern Hills and dropping down into the Thames Valley at Marlow. It then follows the Thames for a short while before going through wood heathland to Iver and West Drayton. It then follows a green corridor running parallel to his probable route in the shape of the towpath beside the Grand Union Canal then from Brentford it follows the Thames towpath to reach Shakespeare’s Globe. The Chiltern Way was created by the Chiltern Society as its Millennium Project. It is a circular waymarked walking route of 125 miles taking in some of the finest scenery in the country. The Way passes through the most attractive parts of the Chilterns, including the Bovingdon Plateau, the Chess Valley, the Misbourne Valley, Penn Country, Hambleden Valley, Stonor Park, Ewelme, Swyncombe Down, Bledlow Ridge, Hampden Country, Bulbourne Valley and Dunstable Down. In 2003 two extensions were added to the route the Chiltern Way Southern Extension adds a loop of 31 miles from Bix Bottom via Mapledurham on the Thames and the Chiltern Way Northern Extension a loop of 27 miles from Sharpenhoe Clappers via the Icknield Way and the outskirts of Hitchin. In 2010 to mark the 10th anniversary of the Chiltern Way the Chiltern Society developed a new extension of 28 miles called the Berkshire Loop from south of Penn taking in Winter Hill, Ashley Hill, Remenham Hill and Henley Bridge to Harpsden Bottom. With the pub behind us we head forward and turn left between the houses school sign on the right. At the end of the houses we walk into the trees on the Chiltern Way. We come out into the open and keep heading forwards through the field with the hedge on our right to a minor road. We cross straight over and head forward uphill into the wood. After passing through the trees we head forward on the stone track which becomes a tarmac track. At the fork we keep left and soon come to a minor road. We turn left for a short way before turning right onto a gravel track, Shakespeare’s Way. We soon come to a gate and cross over the stile then head forwards with the hedge on our right towards the wood. We go over the stile into the wood and head forward. At the crossroads of paths we keep heading forward uphill on the path. When we come out into the open we bear slightly left to reach a gate at a t-junction in a minor road. We cross the stile and continue straight ahead. When we reach Upper Woodend Farm we bear left on the bridleway still following Shakespeare’s Way. At the end of the track we bear off right, yellow arrow, through the trees. When the trees thin out we bear left at the fork downhill. At the signpost we cross straight over and take the track slightly on the right. The track bends right and we ignore the footpath going off to the left. When the path splits we bear right following the white arrow on the tree and when the path splits again we bear left. We soon come to a tarmac track and turn right then left at the t-junction of tracks following the white arrow on the tree. We come out of the trees into the open and head forward bearing right at the yellow arrow into the trees. We soon come out of the trees again and head forward on the path between the hedges to reach the road. We now turn left for a short way before taking Collins gate on the left. We then turn right through the field to cross over a stile onto a little back road. We turn left then pass through the churchyard into Hambleden. After a look around and a cup of tea we head back through the churchyard back onto the little back road and take the gate on the right. We head across the field towards the houses on the other side. With the houses on our right we head forward through the field, pass through a gate, and through the next field. We cross over a track and head forward on a narrow path between some houses and gardens. We head forwards through the fields then pass through the hedge to continue forward to a minor road. We turn right heading along the road past the house on the right until we come to a right hand bend. We head straight ahead onto a gravel path. We keep heading forward through a tunnel of trees then cross over a tiny tarmac track. In the next field we keep heading forward to the left of a tree. When we come to a tarmac tack we go through the gate and cross straight over through the gate opposite. We continue ahead through the fields to the minor road at Skirmett. We turn left then right and follow the road through the village. We head uphill on the road until we come to a junction at Fingest we bear round to the right. At the bench on the right we turn left and go through the gate at the end of the wall. We follow the path and at the end of the wooden fence we come to a wooded area we turn left to the road and then cross straight over through the trees. We come out into the open and follow the path through the field, with the windmill on our right, making our way down back into the village of Turville. This is a moderate walk on field and woodland paths and tracks. Some minor tarmac road and some moderate inclines and declines. Elevation: approx lowest point 44.80m (146.98ft) approx highest point 195.70m (642.06ft) approx ascent 242.70m (796.26ft). Approx 8.5 miles allow 3½ – 4 hours using OS Explorer Map 171, Chiltern Hills West, Henley-on-Thames and Wallingford. This walk is done anti-clockwise. Start point: Turville village green. Turville and Hambleden are in the Chiltern Hills, Buckinghamshire north of Henley-on-Thames. On the M40 from High Wycombe take junction 5 and turn left onto Ibstone Road. After passing through Ibstone bear right at the y-junction then bear left at the next junction and follow the road to Turville. Coming off the M40 at junction 5 in the opposite direction turn right over the top of the M40 onto Ibstone Road then continue as above. Parking: Free roadside parking around the green and also next to the pub in Turville. There are no public toilets the nearest ones are at High Wycombe and Henley-on-Thames. For refreshments there is a pub in the villages of Turville, Hambleden, Skirmett and Fingest. In Hambleden there is also a Post Office/shop and a tearoom.